This framework may seem foreign at first, but according to the underlying theories behind CVNC, this form of communication isn’t based on anything new—it’s what meaningful communication looks like in the absence of violent thoughts and feelings. Thus, it’s a model to be learned—or rather, in a sense, re-learned. One of the first steps in learning a better way of communicating is to know your own heart and soul—what you feel, what you need and what you want. Expressing your feelings is one thing—having the vocabulary to express those feelings is another, especially considering so many of us have been conditioned to suppress our feelings. If you struggle to verbalize how you feel, this process may seem quite challenging, or even silly. However, if you have become violent toward your partner, it’s worth considering that the violence has actually emerged from those stifled or unexpressed emotions, and therefore learning to communicate those feelings calmly may be a way to disrupt the cycle of violence. Feelings are typically expressed as adjectives. What do you feel when your needs are unmet? Do you feel hurt, agitated, disappointed or envious? What about when your needs are being met? Do you feel happy, satisfied, warm? Consider starting a journal just to make a running list of adjectives like these. Another important facet of this self-discovery is to identify your needs—so make another list in your journal of what you believe your most basic needs are. Do you feel the need for freedom? For belonging? To be understood? The thrill of a challenge? A sense of purpose? Once you’ve identified these needs, you can begin associating feelings with those needs as they are met, or otherwise unmet. Communication is not a one-way street. It’s not one person transmitting information and the other person receiving that information. Communication runs in both directions. 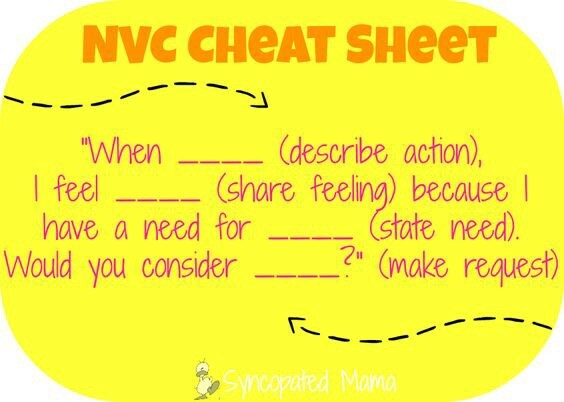 For that reason, the CNVC approach applies the four steps of observation, feelings, needs and requests in both directions: empathetically listening and honestly expressing. Your partner also has feelings and needs, and hers are just as valid and important as yours are. Thus, effective nonviolent communication involves learning to listen compassionately to the observations, feelings, needs and requests of the other person, then honestly sharing your own. Domestic violence is a toxic, destructive cycle that can cause serious harm to people you care about as well as yourself—not to mention the legal and criminal complications of it. The best thing you can do for yourself and your family in the wake of a domestic violence arrest is to take concrete steps to break the cycle before it repeats—to make sure it doesn’t happen again. The concept of nonviolent communication can be a powerful tool to help disrupt this cycle and start you on the process of restoring your family to wholeness. If you’re facing domestic violence charges and need compassionate legal representation, we are here to help. Call our offices to learn more.